Check Balance – on all of your IMB Wallet and Cards. Stop Card – in the event your MasterCard (Debit Card) is lost or stolen. 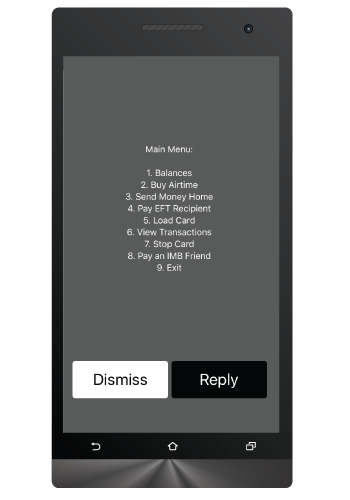 Load Card – move money from your IMB Account to your IMB Card/s. Send Money - IMB Wallet to Wallet Transfer. Buy pre-paid Airtime - Vodacom, Cell C, MTN, TelkomMobile. Buy pre-paid Electricity – coming soon.